I love vintage things, so this craft was right up my alley. These were also relatively simple to make as well as cost efficient, so I am happy to share it with all of you! Take your aluminum foil tube and cut 2 inch long sections. We wanted two milk bottles so we cut two. Discard the lids of the hotel shampoo bottles. Measure an inch and 1/4 from the top opening of the bottles, and draw a line around the bottle. Using an exacto knife, cut on the line to remove the tops. Next, hot glue the tops of the hotel shampoo bottles to the top rim of the aluminum foil tubes. As you can see, I had an assortment of silver buttons lying around. 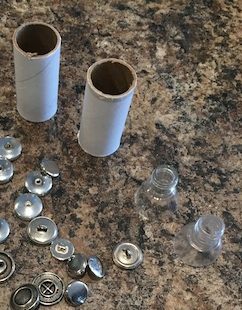 I chose two that I thought would be perfect bottle tops, and hot glued them to the tops of my milk bottles. Next I coated the inside of the plastic shampoo bottle top with white paint. I just drizzled some paint inside, and swirled it around to coat the entire top. 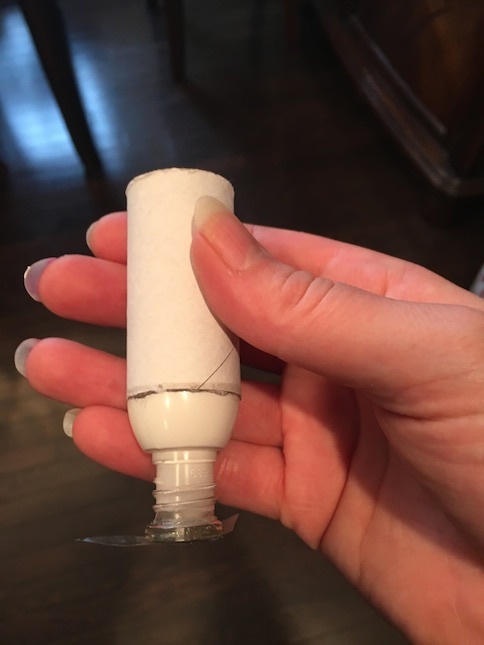 Our button bottle cap had a hole in the top, so I put a piece of tape on top to keep the paint from dripping out while it dried. Once the paint is completely dry on the inside of your bottle, paint the outside of the aluminum foil tube white. I know that it is already white, but a crisp coat of paint is nice to cover any flaws in the tube. Now the bottles are ready for labels! I used a pink script font in Word to make a label. Then I cut it out, and wrapped it around the bottle, securing it with a glue stick. I wrapped packing tape around the milk bottles to laminate the labels. These little vintage doll milk bottles are very cute, and so easy to make! Has anyone guessed yet what our secret project is? 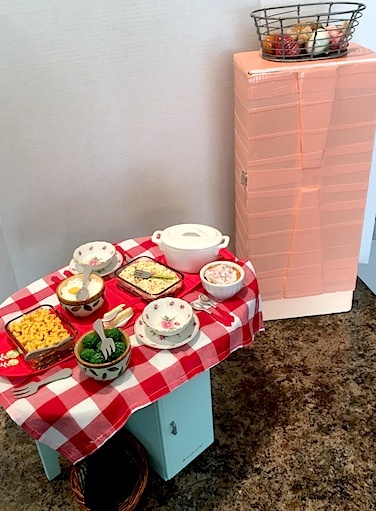 If you guessed Maryellen’s Fridge, then you’re right! Yay! So exciting! So mysterious! Don’t you just want to open the fridge?! We hope that you enjoyed!